Easy preparation slow cooker kit. 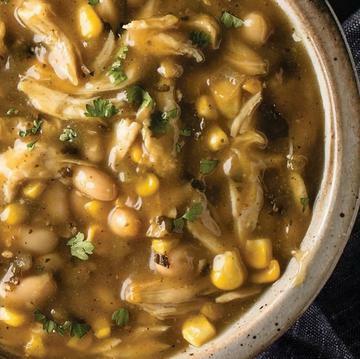 The whole family loves it, but White Chicken Chili used to require a cabinet full of ingredients... simplify with this all-included crazy-flavorful chili ready for your slow cooker. No chopping, prepping, sautéing, or mixing - all you need to do is start it in the morning and head out for your day! While you're gone, a warm, creamy broth of chicken stock and cream with garlic & spices will be slowly working its magic on premium chicken, white beans, sweet corn, green chiles, onions, and mild jalapeños. When you come back to the house hungry... your perfect meal awaits. Feeds a happy family of four to eight. FOR FOOD SAFETY AND QUALITY, FOLLOW THESE COOKING INSTRUCTIONS. FOOD MUST BE COOKED TO AN INTERNAL TEMPERATURE OF 165°F AS INDICATED BY A FOOD THERMOMETER. Preparation: READ INSTRUCTIONS THOROUGHLY. Instructions based on 6-quart slow cooker. Appliances vary; adjust cook time accordingly. Do not thaw. Keep frozen until ready to cook. Remove bag and 2 packages of chicken from box. Carefully open bag with vegetables and remove 3 sauce pouches. Place chicken and sauce pouches under cold water to loosen film. Open chicken pouches and place chicken in slow cooker. Open sauce pouches and add sauce, ½ cup water and vegetables to slow cooker. Cook on LOW for 8 hours or HIGH for 6 hours. Stir and serve. Instructions based on 4-quart slow cooker. Appliances vary; adjust cook time accordingly. Do not thaw. Keep frozen until ready to cook. Remove bag and 2 packages of chicken from box. Carefully open bag with vegetables and remove 3 sauce pouches. Place chicken and sauce pouches under cold water to loosen film. Open chicken pouches and place chicken in slow cooker. Open sauce pouches and add sauce, ½ cup water and vegetables to slow cooker. Cook on LOW for 8 hours or HIGH for 6 hours. Stir and serve. Ingredients: Chicken Breast, Water, Corn, Great Northern Beans, Heavy Cream (Grade A Cream, Carrageenan), Onions, Chicken Stock Base (Chicken Stock, Chicken Flavor, Sea Salt, Yeast Extract, Chicken Fat, Garlic Powder, Vegetable Stock [Carrot, Celery, Onion], Bay, Thyme, Marjoram, Carrot Powder), Green Chiles, Spices, Garlic Puree, Modified Corn Starch, Green Jalapenos (Jalapeno Peppers, Vinegar, Salt And Natural Flavors), Soybean Oil, Salt.